As Sunday morning came, I was in deep thought concerning the era that we Christians have been placed into by our Holy God. As I made supplication before the Lord, He divinely led me to the prophet Isaiah for some instruction. I must say, as I read Isaiah 58-59, I became very burdened in my spirit. What God revealed was the practice of worship in ancient Judah was nothing more than a snapshot of Christianity in the West today. What Isaiah saw was a carelessness in worship and love of God. This halfhearted devotion was moving swiftly toward their downfall. Judah was in a downward spiral. God was not moving among them because they were not truly faithful to Him. Mercy was nonexistent. Putting others first was unheard of. True love was sadly absent. In short, their worship had become self-centered and mechanical. The blessing and favor of God was not found in their nation. 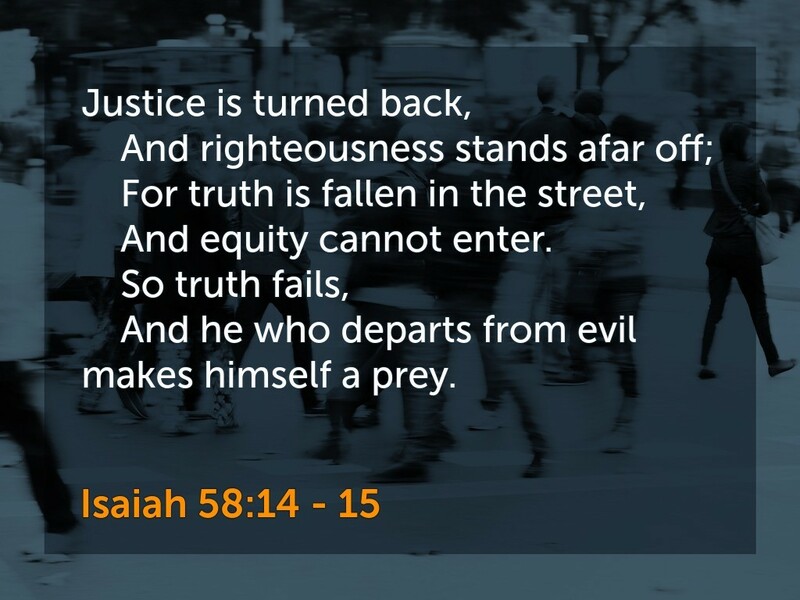 The result was God's word, His life changing truth, had fled, it was missing, truth had fallen in the street. The influence of God's people had become null and void and the population, including the leaders, no longer cared to hear what God had to say. The lesson: When we forsake the Lord through mechanical devotion; when we become self-serving and forget about what matters to the Lord, He does not move among us in mighty ways. We know this because we see it. We even ask why is God not listening? We must examine ourselves to see where we have strayed. God summed up Judah's devotion and found it severely lacking. The result was a nation that once could boast of the mighty power of God among them being carried away captive into exile. God had to perform a restart. In Part one of this post, Isaiah 58, we cover Judah's apathy in worship, How God views it, and what they have really rejected in choosing to reject Him. 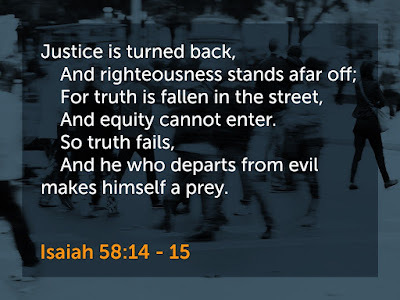 In part two, Isaiah 59, we will come face-to-face with the reality that what goes around, comes around. Truth, really never fails. When society rejects God all that can remain is judgment. Could the Lord be readying for another restart? Isaiah was a chosen vessel of God who, like all prophets, was tasked at times with words of comfort, and at others, with words of rebuke and chastisement. The time frame Isaiah speaks of is that time just before the Babylonian destruction of Judah and eventually, Jerusalem (606- 587 B.C.). Without getting to exhaustive, I would like to note two things that were at play then and also, I believe, are at play today. First, the government of Judah had become corrupt and had snubbed the message of repentance the prophets had been commissioned to bring. Instead, they chose to listen to false prophets—those who would tell them what they desired to hear. Later, Ezekiel and Jeremiah would bring this to light, Ezek. 13:6-8; Jer. 23:31-32. Isaiah uses the phrase "her dignitaries are starving, and her masses are parched with thirst," to express how falsehood and injustice had brought the nation to the brink of spiritual bankruptcy.1 From the highest leader in government to the lowest man on the street, spiritual drought was the clothing they wore. "If a ruler listens to lies, all his officials will be wicked" (Prov. 29:12 HCSB). Second, the priests of the temple and the land had displaced true faith and religion with a system of works that was empty, futile, and regurgitating. Even Jesus, hundreds of years later, would rebuke the religious leaders as "whitewashed tombs full of dead men's bones and every impurity" (Matt. 23:27). They never learned. Let's begin by validating the stale devotion of the priests and the people in their worship of God and their service to one another. 58:1 Shout out loud! Don’t hold back! to the house of Ya‘akov [Jacob] their sins. and [claim to] delight in knowing my ways. 3a [asking,] ‘Why should we fast, if you don’t see? Note the text begins with Jehovah calling for the prophet to uncover their sins. To let them know that despite the fact they believe they are living righteously, God is not pleased in any way or fashion. Their worship was not real worship. One thing they do notice is that God is not moving among them in life-changing ways as He once did. But, instead of examining themselves, whether they are truly living righteously, they blame God saying, "Why should we fast, if you don't see? Why mortify ourselves, if you don’t notice?" Surely they know nothing escapes God's notice, but here they act as if He is not omniscient (all knowing). However, under the surface, what we see is an unrighteous complaint. God Answer to their Complaint. while keeping your laborers hard at work. to lashing out with violent blows. a day when a person mortifies himself? and spread sackcloth and ashes under yourself? The prophet follows them to their place of assembly on a fast day. There, off in a corner, two men are not evaluating their own conduct and that of their nation; they are not seeking the face of God in true repentance. They are carrying on a business transaction. Or again, while they are publicly engaged in holy exercises, at home the laborer who is working for them is slaving under heavy burdens and is being oppressed. Heavy social wrong-doings are being tolerated and practiced. The point is that the people of Judah were so spiritually bankrupt that they didn't know how to truly worship God. In vs. 5, Isaiah tells us they would "mortify themselves" and "hang their head like a reed" as if this was what God wanted. This is exactly what Jesus referred to when He exhorted the disciples to not fast with "disfigured faces" (Matt. 6:16) that others may see this. Our fasting is to be alone and before God in humble worship, relying on Him for our sustenance. Do we seek to please God or man? God is merciful, so He tells them in vss. 6-7 what an acceptable fast would be. Fasting has always been a form of abstinence from food6 and there were many fasts Israel observed throughout their year (Lev. 23). The fast here in Isaiah takes on the nature of personal non-obligatory fastings in order to bring about favor from God. That said, they had it partially right, but left many other things that would show true personal devotion left undone. They did not set the day aside to do things to glorify God. No. Instead, they fought with one another (even to fists) with their contemptible attitudes.They oppressed their workers and did not treat them kindly. They went about as if they were to be pitied because of hunger. But they were not cognizant of the needs of others, so they were remiss in serving those around them, nor were they merciful. Neither did they free others during their fast from being yoked to them, whether by labor or any other debt. The remaining verses of Isaiah 58 pronounce the blessings God would give to all who would serve Him in a genuine way. This includes worship to God service toward fellow man, and fasting for the right reasons. These are the words of comfort that show our Lord to be One who will be faithful to all who serve Him in truth. and your gloom become like noon. These promises in many ways mirror the promises God gives to all His faithful today. But in considering when this prophecy was uttered we have to ask: Did Israel stand for truth? Did they heed the words of the Lord? Or, will the final fulfillment of these promises be withheld until such a time that they finally surrender in fullness to Yeshua [Jesus] as Lord? Click here for Part two of "The Day Truth is Taken Captive Pt.2"
1 - The Holy Bible: Holman Christian Standard Version. (Nashville: Holman Bible Publishers, 2009), Is 5:13." 2 - David H. Stern, Complete Jewish Bible: An English Version of the Tanakh (Old Testament) and B’rit Hadashah (New Testament), 1st ed. (Clarksville, MD: Jewish New Testament Publications, 1998), Is 58. 3 - Ibid Is 58:3–5. 4 - H. C. Leupold, Exposition of Isaiah, vol. 2 (Grand Rapids, MI: Baker Book House, 1971), 286. 6 - "Fasting is the deliberate, temporary abstention from food for religious reasons." John Muddiman, “Fast, Fasting,” ed. David Noel Freedman, The Anchor Yale Bible Dictionary (New York: Doubleday, 1992), 773. 7 - David H. Stern, Complete Jewish Bible: An English Version of the Tanakh (Old Testament) and B’rit Hadashah (New Testament), 1st ed. (Clarksville, MD: Jewish New Testament Publications, 1998), Is 58:8–14.